Much of the success of single agent deep reinforcement learning (DRL) in recent years can be attributed to the use of experience replay memories (ERM), which allow Deep Q-Networks (DQNs) to be trained efficiently through sampling stored state transitions. However, care is required when using ERMs for multi-agent deep reinforcement learning (MA-DRL), as stored transitions can become outdated when agents update their policies in parallel \citefoerster2017stabilising. In this work we apply leniency \citepanait2006lenient to MA-DRL. Lenient agents map state-action pairs to decaying temperature values that control the amount of leniency applied towards negative policy updates that are sampled from the ERM. This introduces optimism in the value-function update, and has been shown to facilitate cooperation in tabular fully-cooperative multi-agent reinforcement learning problems. 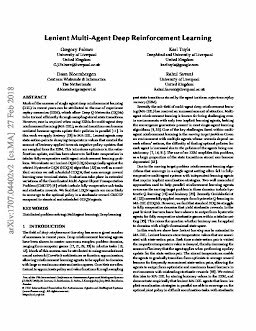 We evaluate our Lenient-DQN (LDQN) empirically against the related Hysteretic-DQN (HDQN) algorithm \citeomidshafiei2017deep as well as a modified version we call scheduled -HDQN, that uses average reward learning near terminal states. Evaluations take place in extended variations of the Coordinated Multi-Agent Object Transportation Problem (CMOTP) \citebucsoniu2010multi. We find that LDQN agents are more likely to converge to the optimal policy in a stochastic reward CMOTP compared to standard and scheduled-HDQN agents. Palmer, G, Tuyls, K, Bloembergen, D, & Savani, R. (2018). Lenient multi-agent deep reinforcement learning. In AAMAS '18 - Proceedings of the 17th International Conference on Autonomous Agents and MultiAgent Systems (pp. 443–451).